Apple's self-driving car was involved in its first recorded accident while merging onto an expressway. 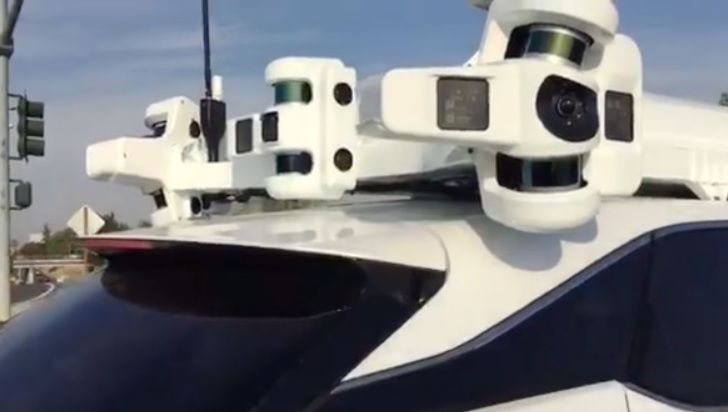 Bloomberg's Mark Gurman said on Twitter, "Apple has disclosed the first accident involving one of its self-driving test cars. The Apple test car was rear-ended by a Nissan Leaf while it was merging onto an expressway. Moderate damage to the car, no injuries reported." The car was rear-ended near the company's Silicon Valley headquarters this month but the accident report wasn't posted until Friday. The report confirms that Apple is still in the race to build a self-driving car and although Apple executives have never publicly revealed the company's self-driving car program. Apple is known for being very secretive and CEO Tim Cook heads the company in a very calculated manner. They are even known for having their own "police" that investigate crimes internally. Filings in a criminal court case last month confirmed that the company had at least 5,000 employees working on the self-driving car project which involved a "proprietary chip". The company appears to be serious about joining the world's autonomous car industry which is still in its infant years. A report published on the California Department of Motor Vehicles website said that on August 24, one of Apple's Lexus RX 450h self-driving test cars was in "autonomous mode" when it was merging south on the Lawrence Expressway in Sunnyvale, California. The report says the Apple's car was traveling at less than 1 mph when it was rear-ended by a 2016 Nissan Leaf going about 15 miles per hour. Apple confirmed the accident took place around 3 p.m. in the afternoon and no one was hurt. Robot cars constantly being hit by human drivers will be the cause of the coming robot wars. I hope people drive off and crash into all the self driving vehicles and then sue the companies! Never give up your freedom of mobility, but we have a bunch of retarded millennials!